Identifying Roman Coins – 1st, 2nd, 3rd or 4th century? Learning to identify Roman coins requires experience and lots of it, however when you get started it can sometimes feel like you can’t see the wood for the trees. Nevertheless there are some tips and sources that’ll make it significantly easier to get to grips with Roman coins, so in this and following posts, I’ll share some of my tips on how to identify Roman coins. This guide will look at the general appearance of coins and how to quickly sort them by century and provide a little context, the next post will focus on the inscriptions and what information they contain. Then with the basics explained I’ll go into more detail on how to identify portraits, denominations and how to identify the coins once you’ve separated them into the below groupings. Since Roman coins in Britain will generally date from Imperial period of the ancient world which incorporates 400 years of history, the first thing to do is to break them down into smaller categories to digest and handle. Coins from different centuries will be easily dated by slightly different criteria so if you can tell which century the coin is from it’ll narrow down what emperor it’s likely to portray and thus save time. 1st century and 2nd century Roman coins in Britain, if you will allow such generalisations, tend to be larger and weightier issues. This is because in the latter stages of the Roman Empire monetary reforms and economic & political instability significantly alter the appearance of Roman coins. Therefore if you have a thick copper-alloy coin around 20-35mm found in Britain then it would more likely than not, be a 1st or 2nd century coin, a Sestertius, As, Dupondius or such. Silver issues of this period are the Denarius, they’re smaller around 15mm-20mm, silver and with that significant weight that is the trademark of the earlier stable Roman coinages. The composition of the metal is good so that they do preserve well so the inscriptions are legible fairly often, furthermore the busts are veristic and true to the appearance of the emperors portrayed so that you can identify them on the basis of their looks. The 3rd century was a very tumultuous time of the Roman Empire in both political and economic scenes and in the early part of the century the antoninius (commonly referred to as a radiate) was introduced however this would prove to only add to the inflation and debasement problems. 4th century coins are again very easily recognisable in comparison to earlier issues. After coin reforms at the end of the previous century the radiate is taken from circulation and the nummus, siliqua & solidus are introduced. The busts on 4th century coins are very stylised and easily differentiated from coins of previous centuries portraying an idealised image which is used by many emperors therefore it is no longer possible to identify them by the portraits, fortunately since the coins are made from a better composition the inscriptions do survive so that they can be identified in this manner. 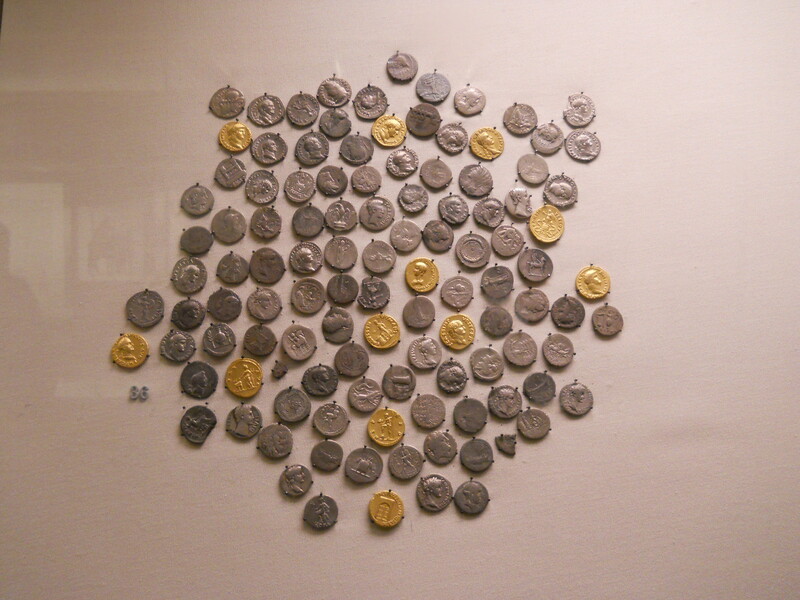 Furthermore in the 4th century the reverse designs become very standardised so that numismatists have constructed chronologies of the designs and they can be easily identified by these reverse designs. A very useful resources for 4th century coins is http://www.tesorillo.com/aes/home.htm , it also caters for bronze coins of the 5th century, and offers a guide to the reverse patterns of later Roman Coins. These coins are generally 25mm or smaller often around the 15mm size and they are of a slim thickness. Interestingly within the 4th century itself the colour of the coins appears to change so that the more red looking the coin the later within the 4th century it is likely to be, indeed they also appear to get smaller as the century grows old. Next week, Decoding inscriptions on coins.